Richard Conway, freelance spy, is in a bit of jam. He's been accused of a crime he didn't commit, and finds himself consequently embroiled in all manner of corporate espionage, backstabbing and police corruption. At his disposal are his Crosslink--a gadget that lets him manipulate the circuitry on lights, switches, cameras and doors--and a pair of Bullfrog Hyper Trousers which empower him to leap incredible distances. 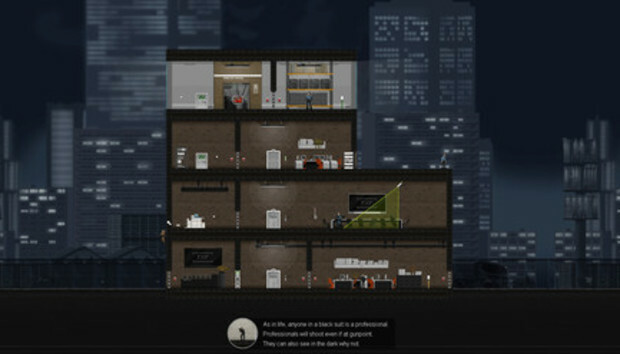 It's the premise of Gunpoint, a sort of action-puzzler: your objective is generally to steal something, or hack into a terminal to acquire or wipe or sabotage data. You'll actually be spending most of your time hacking--rewiring light switches to open up automated doors, re-configuring motion sensors to trigger lights as guard walk past, disabling alarms and generally getting from point A to B in the fastest, quietest way possible. Like every good video game, you're awarded a score at the end of every mission. Guards patrol the facilities you'll be burglarizing and shoot on sight, so you'll need to dispatch them or give them the slip. There's always the direct approach, which involves barreling into them with your impressive jumping ability and pummeling them to death. I prefer to be subtle: connect a light switch to a power outlet and electrocute them as they walk past, or remotely call an elevator to their floor, slinking by while they're investigating the noise. Extra gadgets will augment your abilities and serve up more options for solving problems. The Longshot, for example, will rewire enemy guns, causing them to trigger other objects instead of, well, killing you. The Hushcracker will muffle the sound of breaking glass, allowing you to get the drop on foes without alerting their comrades. And the aptly named Resolver is a handgun--shoot guards (which will alert the local police) or hold them at gunpoint and make your brazen escape, albeit leaving living witnesses. Gadgets are purchased with the cash you earn by successfully completing the game's handful of missions. You're usually offered two missions at a time to choose from, and things get complex surprisingly quickly: it's a whodunit where everyone seems at least a little bit guilty, and every move you make seems certain to see you dead, or exchanging your trenchcoat for less flattering pinstripes. Supporting one client usually means betraying another, which opens up some opportunities for replay value. There are also laptops hidden in most of the levels, whose data doesn't offer any tangible rewards (besides a Steam achievement), but offer a great deal of backstory and intrigue. Overall the story is a clever one, with an amicable cast of characters (as relayed by text messages on cellphones) and plenty of witty banter from the comically inept Conway. Once you're done with the game (it is a bit on the short side) there's always a level editor, so you can try your hand at making your own missions and sharing them with friends. Gunpoint can be yours for a mere $10 on PC, though it's currently on sale for $9. You can find it on Steam or directly from the site, which offers pricier editions that include the game's soundtrack and other goodies.